(ancient times). His thought had enormous impact on the development of Western (having to do with American and European thought) philosophy. Plato was born in Athens, Greece, the son of Ariston and Perictione, both of Athenian noble backgrounds. He lived his whole life in Athens, although he traveled to Sicily and southern Italy on several occasions. One story says he traveled to Egypt. Little is known of his early years, but he was given the finest education Athens had to offer noble families, and he devoted his considerable talents to politics and the writing of tragedy (works that end with death and sadness) and other forms of poetry. His acquaintance with Socrates (c. 469–c. 399 B.C.E. ) altered the course of his life. The power that Socrates's methods and arguments had over the minds of the youth of Athens gripped Plato as firmly as it did many others, and he became a close associate of Socrates. The end of the Peloponnesian War (431–04 B.C.E. 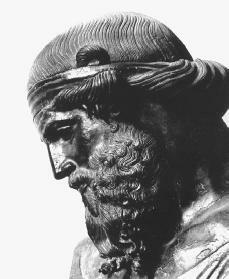 ), which caused the destruction of Athens by the Spartans, left Plato in a terrible position. His uncle, Critias (c. 480–403 B.C.E. ), was the leader of the Thirty Tyrants (a group of ruthless Athenian rulers) who were installed in power by the victorious Spartans. One means of holding onto power was to connect as many Athenians as possible with terrible acts committed during the war. Thus Socrates, as we learn in Plato's Apology, was ordered to arrest a man and bring him to Athens from Salamis for execution (to be put to death). When the great teacher refused, his life was threatened, and he was probably saved only by the overthrow of the Thirty Tyrants and the reestablishment of the democracy (a system of government in which government officials are elected by the people). Plato welcomed the restoration of the democracy, but his mistrust was deepened some four years later when Socrates was tried on false charges and sentenced to death. Plato was present at the trial, as we learn in the Apology, but was not present when the hemlock (poison) was given to his master, although he describes the scene in clear and touching detail in the Phaedo. He then turned in disgust from Athenian politics and never took an active part in government, although through friends he did try to influence the course of political life in the Sicilian city of Syracuse. Plato and several of his friends withdrew from Athens for a short time after Socrates's death and remained with Euclides (c. 450–373 B.C.E. ) in Megara. His productive years were highlighted by three voyages to Sicily, and his writings, all of which have survived. The first trip, to southern Italy and Syracuse, took place in 388 and 387 B.C.E. , when Plato met Dionysius I (c. 430–367 B.C.E. ). Dionysius was then at the height of his power in Sicily for having freed the Greeks there from the threat of Carthaginian rule. Plato became better friends with the philosopher Dion (c. 408–353 B.C.E. ), however, and Dionysius grew jealous and began to treat Plato harshly. When Plato returned to Athens, he began to teach in the Gymnasium Academe and soon afterward acquired property nearby and founded his famous Academy, which survived until the early sixth century C.E. At the center of the Academy stood a shrine to the Muses (gods of the arts), and at least one modern scholar suggests that the Academy may have been a type of religious brotherhood. Plato had begun to write the dialogues (writings in the form of conversation), which came to be the basis of his philosophical (having to do with the search for knowledge and truth) teachings, some years before the founding of the Academy. To this early period Plato wrote the Laches which deals with courage, Charmides with common sense, Euthyphro with piety (religious dedication), Lysis with friendship, Protagoras with the teaching of virtues, or goodness, and many others. The Apology and Crito stand somewhat apart from the other works of this group in that they deal with historical events, Socrates's trial and the period between his conviction and execution. Plato's own great contributions begin to appear in the second group of writings, which date from the period between his first and second voyages to Sicily. The Meno carries on the question of the teachability of virtue first dealt with in Protagoras and introduces the teaching of anamnesis (recollection), which plays an important role in Plato's view of the human's ability to learn the truth. Socrates is again the main character in the Republic, although this work is less a dialogue than a long discussion by Socrates of justice and what it means to the individual and the city-state (independent states). Just as there are three elements to the soul, the rational, the less rational, and the impulsive irrational, so there are three classes in the state, the rulers, the guardians, and the workers. The rulers are not a family of rulers but are made up of those who have emerged from the population as a whole as the most gifted intellectually. The guardians serve society by keeping order and by handling the practical matters of government, including fighting wars, while the workers perform the labor necessary to keep the whole running smoothly. Thus the most rational elements of the city-state guide it and see that all in it are given an education equal to their abilities. Only when the three work in harmony, with intelligence clearly in control, does the individual or state achieve the happiness and fulfillment of which it is capable. The Republic ends with the great myth of Er, in which the wanderings of the soul through births and rebirths are retold. One may be freed from the cycle after a time through lives of greater and greater spiritual and intellectual purity. Plato's third and final voyage to Syracuse was made some time before 357 B.C.E. , and he tried for the second time to influence the young Dionysius II. Plato was unsuccessful and was held in semicaptivity before being released. Plato's Seventh Letter, the only one in the collection of thirteen considered accurate, perhaps even from the hand of Plato himself, recounts his role in the events surrounding the death of Dion, who in 357 B.C.E. entered Syracuse and overthrew Dionysius. It is of more interest, however, for Plato's statement that the deepest truths may not be communicated. Plato died in 347 B.C.E. the founder of an important philosophical school, which existed for almost one thousand years, and the most brilliant of Socrates's many pupils and followers. His system attracted many followers in the centuries after his death and resurfaced as Neoplatonism, the great rival of early Christianity. Kahn, Charles H. Plato and the Socratic Dialogue: The Philosophical Use of a Literary Form. New York: Cambridge University Press, 1996. Shorey, Paul. What Plato Said. Chicago: University of Chicago Press, 1933.